Almost everyone except those psychologically and politically dependent on accusing others of being racists can agree that racism is evil. I think almost everyone except those malignant defamers, who denounce all with whom they disagree as racist, can agree that all people are fundamentally equal and must be treated equally; that all definable groups of people are equal in their human merit; and that all such groups, unless they are defined by sociopathic goals, should be proud of whatever it is that defines them as a group. I cannot think of a more stupid and unjust reason for hiring or not hiring, electing or voting against, befriending or shunning anyone, than the ancient points of discrimination: race, sect, gender, sexual orientation, economic level, or, within reason, opinions on almost any subject. Racism, in all advanced societies, and certainly in North America, is now as rare and unrigorous as the flat-earth society. There are some white supremacists and white and non-white people who hate whites, but they are a very small percentage of the population. Almost no one anyone knows cares a jot about what race anyone is. It's as fatuous, though more sinister, as screaming at people who have antimacassars on the arms of their chairs, part their hair differently, or like a different flavour of ice cream. The fact that there is such a consensus has driven the forces of hate to the desperate nostrum of accusing those that they hate, for reasons of envy or political disagreement, of being racists. At times, it requires Job-like patience to keep in mind what a mighty victory for the tolerant majority the desperation of this scum represents. There are very few racists, so the psychotic malcontents are cornered in our society with no tactic left but to accuse others of what afflicts them. In the same measure that racism was a prevalent view a hundred years ago, when most whites considered non-whites inferior, most Chinese considered non-Chinese inferior, and most whites considered many other whites inferior, those prejudices rarely surface now. When I was born, though I was too young to be aware of it, the inheritors of the splendid civilization of Goethe and Beethoven were massacring millions of people for religious, sectarian, ethnic and political differences. I and a very large number of readers remember the murder of millions of Chinese and Cambodian and Vietnamese non-communists, and of Rwandans and Sudanese of a minority tribe or religion. Of course, some of this persists in parts of Africa and Asia, but in advanced countries, racism is reduced to a handful of deranged or sub-humanly stupid people. The great nation ruled when I was born by the Nazis has in the last three years admitted a million penurious refugees from Africa and the Middle East. It has been difficult and controversial and could not be allowed to continue indefinitely, but the German government that did so is almost certain to be re-elected this month. In the United States, 143 years after the abolition of slavery and only 43 years after segregation was outlawed and most African-Americans were enabled to vote, the country had an African-American president and attorney general. Nothing is perfect and we are all sinners, but mankind has moved overwhelmingly and irresistibly against discrimination for any reason except conduct. In Martin Luther King's resonant phrase, it is "the content of (a person's) character" that determines how people are treated. One of the clearest demonstrations of the triumph of anti-racialism is the spurious and defamatory quality of most accusations of racism in advanced societies. 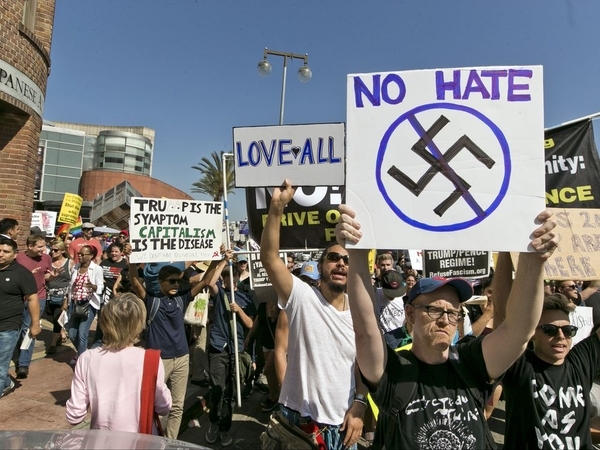 President Trump has many irritating foibles, and it is anyone's guess whether he will be a successful leader of his country or not, but the accusation that he has sympathy for Nazis or the KKK is a monstrous falsehood unsupported by a scintilla of evidence. I myself (though I repeat until I am almost blue in the face that the native people were and are intellectually the equal of whites, and often physically superior) have been reviled as a racist by some native militants because I have made the point that native civilization was barely entering the Bronze Age when the Europeans arrived in North America in the 16th century. The antifa (anti-fascists) in the U.S. are largely white semi-Marxists praising and requiring violent physical assault on whites who are evidently anti-Marxist. Black Lives Matter (an indisputable proposition) is partially composed of those who think that non-black lives do not. When in doubt, accuse a political opponent or someone sociologically different of racism. When Dr. Samuel Johnson said that "Patriotism is the last refuge of a scoundrel," it was. Now, charging the tolerant with racism is the last-trench defence of the bigot. These frequent charges of racism flung at non-racists promote racial division, obscure the real racists, making them harder to identify and stigmatize, and enable them to profess support for the wrongly accused to give cover to their own prejudices (as when authentic racists David Duke and Richard Spencer claimed solidarity with President Trump). This practice, on the sleazier edges of the Canadian media, and in the Never Trump factions in the U.S., portrays racism as far more widespread than it is, creating amplified notions of victimhood and paranoia and unfounded group antagonism. It tracks previous false and dangerous alarms such as the Red Scare of the McCarthy era and of the early Third Reich, and the xenophobic hysteria purges and show trials of Stalin in the thirties. It is a confected fear which is supposed to justify a counter-terror that will legitimize the initial allegations. In the liberal media of the United States—The New York Times, Washington Post, Vanity Fair—there have been apologia for antifa. Racism against whites is acceptable, especially when expressed by whites, and those who incite violence against non-racists are seeking a retroactively self-justifying reaction. In this country, the government has over-catered to those requiring restraints on poorly defined habits such as Islamophobia, a practice that is no more or less offensive than incitement of hate against other groups, such as anti-Semitism. There has been too much waffling and havering about the outrageous claims of native militants and their scandalous profanations directed against the distinguished founder of Canada, John A. Macdonald. (Though Prime Minister Justin Trudeau has declined to get on that bandwagon, he should not have changed the name of the Langevin Block of federal government offices. H.-L. Langevin had sticky fingers, but he was not an evil man.) It is a small honour to have received a few such charges myself, made even more implausible by the venomous and almost illiterate ignorance of my accusers. In advanced democratic societies, the appeal to universalism with diversity and to national union will almost always prevail over the poisonous atomization of society. The progress toward a thoroughly tolerant society is inexorable and the psychotic myth-makers and sociopaths within are not persuasive enough, and have too slender a contact with political and social realities, to have any real chance of success. They are drinking their own bathwater and they will perish, unmourned, in their own bile.